CSET Math – Will You Make These Common Test Prep Mistakes? The CSET Math is well known for being a difficult test. 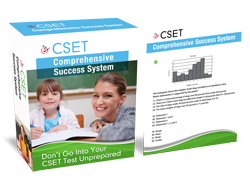 Passing the CSET Mathematics requires using the best study guides and test prep materials. Make sure you use at least 3 full length CSET practice exams. If you’re looking for CSET Multiple Subjects Math click here. The CSET Math Single Subject is known for difficult and even tricky test questions. These tests could easily rattle a well prepared test taker. In particular, the Single Subject Math subtests I and II are known to have a high failure rate. Subtest I, considered by many as the most difficult, has a passing rate in the range of 30 to 40%. This clearly indicates that candidates need to show mastery of advanced Algebra and Number Theory. More than any other subjects, CSET Mathematics often intimidates test takers to anxiety and even downright shock. Therefore, it’s critical to get the best CSET Math study guides you can. If you only use one CSET Math practice test or book you greatly diminish your probability of passing. Many of the CSET Math practice tests only provide the basics, which is not enough to pass. Hence, many test takers take the mathematics exam with a misplaced confidence. Because many CSET Mathematics practice questions make the assessment seem over simplistic. The truth is that many subtest 1 test takers are not prepared for questions more advanced than Algebra 2 or college level Number Theory. The assumption is that middle and high school teachers will not be teaching the advanced stuff. Hence, many CSET math test takers discover too late that this California teacher credential exam is more than they bargained for. It’s not just the content, but the volume that makes the CSET Math test highly intimidating. Thus, if you find a CSET Math practice test rather easy, then something is afoot. It could be that your study material is too easy or you’re the next Alan Turing, the famous war code breaker. The likelihood of the latter is slim while the former is all too obvious as true. Passing the CSET Math requires the best study materials. Your CSET Math practice tests must provide in-depth and easy to understand full answer explanations. Practice question must train you to apply knowledge in unfamiliar problems. The CSET Mathematics is like other CTC exams. For example, the CSET Science test. It measures your subject content knowledge and your skills in applying it. The CTC has implicitly indicated that the preparation materials you need are provided at the official website. Nonetheless, not all candidates are Math majors, which is why complementary materials are pivotal. Believe this: The CSET Math is difficult and complex. Therefore, your review materials should be equal in depth and complexity. This is already implied in the CTC note in the test guide: “some multiple choice questions are more complex questions that require 2 to 3 minutes each to complete.” The operative word here is ‘complex’ so test takers need to take this seriously. CSET Math study guide. Many stand by the Orange County Department of Education or OCDE study guides. For those who need to go through the basics, the “for dummies” series of Mark Ryan or Mary Jane Sterling are great preparatory materials. You may also try Schaum’s Outlines on various Mathematics tests. Actually CTC offers an annotated list of sources that you can use in your test preparation. However, remember what it says about the annotated list of references: “Candidates are not expected to read all of the materials listed below”. Just stick to the essentials and nothing more. Mathematics textbooks. If you have not kept your old books and notes, then visit the library. There are many textbooks dedicated to every subject matter like Algebra, Geometry and Calculus. Avoid basic concepts books and go for the more advanced stuff like higher than Algebra 2 textbooks and the PreCalculus by Michael Sullivan. Make sure you check the content specifications and test guides to identify the topics you need to review. In this way, you need not read the book from cover to cover. CSET Math supplementary sources. Online sites like Answers.com, csetmathguru.com, TeachingSolutions.org/cset-study-guide programs are the popular sites for clarification or follow-up questions for topics that you cannot find in your review books or study guides. For CSET Mathematics subtest I, you may want to check out Richard Delaware’s College Algebra lectures on youtube. The truth is that a good deal of googling can get you what you need. Do this for the History of Mathematics and you will realize that it was not hard looking for study materials after all. CSET Math practice tests. Most CSET study guides come with practice tests. A few of the practice problems of OCDE have appeared in the actual test. This is a good indication of how good the study material is. CSET practice exams are crucial in passing. The more the better. CSET Math calculator. It is only in CSET Math subtest II that you’ll be required to bring a calculator. An important test tip: recheck your gadget after CTC clears its memory. You may need to reset some of the programs to avoid delays during the actual test. For instance, resetting to degrees computation for the sin, cos, and tan will save you precious minutes. You can use this time to review your answers particularly on the constructed responses questions. A good rule of thumb is to aim for a thousand CSET Math practice test questions or 50 to 100 a day depending on your study schedule. Hence, apportioning as much as 80% of your review to a practice exam is highly recommended. One of the primary benefits of joining CSET Math study groups, attending classes or participating in teacher’s forums is in having access to good practice exams. Just make sure that the practice tests provide an answer key with full rationales for both right and wrong answers. You will benefit from the scoring and feedback portion that enables you to identify your weak points or ascertain just how far you are progressing with your review. For CSET Math test takers, the constructed response questions are the hardest. In truth, the CRQs are not necessarily answerable with an essay. A CSET Math constructed response question on the history of mathematics, for example, may simply require you to compare an old formula with a new and updated one. Here, you can create bulleted answers as long as you include the essential elements that answer the question. Also, do not underestimate the CRQs for they could contribute significantly to your total score. Though there is no clear explanation of how scores are weighed, CRQs could be as much as 30% of the total score. The CTC offers a brief guide to answer CRQs that can be summarized in meeting the Purpose, showing Subject Matter Knowledge and providing Support. For some, this CSET Math study guide pdf is as complex as the test itself. Consider this then in answering CRQs: how would you write in a way that explains the problem clear to a student with appropriate ability? Again, practice can readily turn the difficult into easy. Good CSET Math test preparation can be handled in different ways, but the most effective way depends on your learning style, educational background and resources. Do not be too complacent about CSET Math prep. Make sure you find the best learning method that works for you. CSET Math study group. Some individuals do not fare well in studying alone. Creating or joining a study group can impose the discipline you need to stick to your study plan. Moreover, studying with a group means different strengths so every member gets to benefit from another’s mastery of a particular subject. CSET Math prep course. If you think you will benefit from a structured type of review then enroll in a preparation course either online or in an actual classroom. Make inquiries with a nearby college or university for test prep courses and workshops available. The Los Angeles school district course is known for offering quality prep courses. However, you may still ask around for the CSET Math class that will be worth your time and money. You may try the OCDE classes or the University of California Irvine online courses. CSET Math discussions in teacher’s forums. A to Z Teacher Stuff and GreekChat are great places to get valuable insights on important test tips as well as hard to find resources like the CSET Math practice tests. You can get important links to online sites that can help you with specific content that you are still struggling. CSET Math test prep tutor. You may think that only kids or students need tutors, but with the difficulty of this test, you may be looking for assistance yourself. You can ask former teachers or even scout for an experienced CSET Math tutor online or through referrals. However, it may be costly. The csetmathguru site charges as much as $499 for a four hour comprehensive review session for the CSET Single Subject Math. Hence, it is best to thoroughly make the right investigations to seek out a highly competent and fully able test tutor. Although the CSET Math may demand quite a mental workout, it is not impossible to pass the CSET Mathematics test. In fact, candidates should consider this California Subject Examinations for Teachers for Math as another hurdle to pass to achieve excellence. Indeed, it is a bleak future for students when future California math teachers start questioning and even protesting having their mathematics knowledge and professional teaching competencies tested. You may not agree with various aspects of teacher testing including the politics surrounding it. However, don’t lose emotional energy or time griping about it. It simply won’t help you achieve your goal of passing the CSET Math of getting your California teacher credential in mathematics.